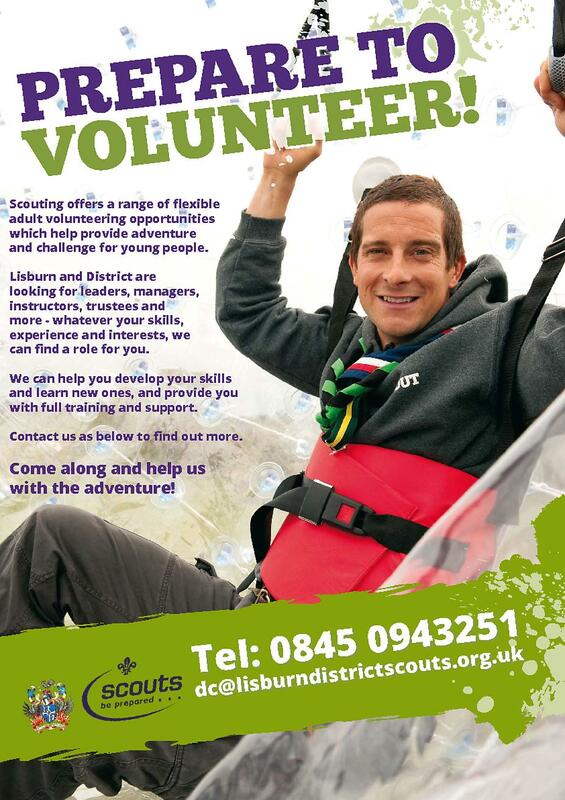 Lisburn district scouts are in need of more volunteer leaders, no experience is required. If anyone out there is thinking about it, just go for it. You don't have to go to every meeting if you can't spare the time, just do what you can, learn loads of new skills, meet like minded people, its great . It's great to see people still willing to put time and effort into Scouting. It's where my enjoyment of the outdoors came from and I know I'm not alone. Whilst I'm obviously plugging Lisburn District if anyone is interested from anywhere in Northern Ireland please let me know and I can put you in contact with your district commissioner via mine and get you talking to the right people. It really is great fun! You can take Squirrels - 4-6, Beavers - 6-8, Cubs - 8-10.5, Scouts 10.5-14 or Explorers - 14-18. There's Network as well from 18-25 but I think they largely look after themselves at that stage. There's tonnes of outdoor stuff and depending on what you want from it you can organise and run almost any type of event you want with the exception of a few more dangerous activities. There's also loads of cheap or free training in outdoors pursuits. I've already been out with and am getting signed off on being a qualified walking leader and NI Orienteering were good enough to offer me a free course to train orienteering next week. With that in mind, I may have an open spot for training next Tuesday 22nd October for Orienteering training. I'm still trying to fill it internally but if I can't I'm sure I could open it up to another scout leader if you want to go. Will i meet Bear himself !!! Yip, and even better than that. You and him* will get dropped off in Buckna and you'll have to cross any rivers at the widest point (and in the buff of course), leap from boulder to boulder rather than walk along the path, eat sheep's goolies up the Collin (probably safer than a chinese takeaway in Ballyclare) and survive an overnight up the Cavey with nothing to light a fire with except discarded underwear (from yer woman). In the morning you'll be making a death slide across Sandyknowes roundabout and then back to the pick-up point on the mound at Corr's Corner. And don't be thinking you'll be taking the path up to the top of that baby, it's straight all the way up. * well obviously the camera crew, ropes consultant, nutritionist and production accountant will be joining you. Bear Nappy AKA (Wolf Larson) VS Bear Grylls would be a funny show. It would be great to see how unfit i am. Bear X SAS and the rest VS Bear Nappy AKA (wolf larson) Beer,whiskey and whatever i can get my hands on, smoke 15 rolleys a day. Poor Bear gets a tough time of it As long as he's helping the kids by being Chief Scout and generally lifting the view that the outdoors can still be "cool" he's alright with me, I've a lot of respect for the guy. I tend to agree, Bear Grylls may not be the most realistic of survival TV presenters but he's brought a great image to the Scouts for the kids and that's what it's about. But isn't scouting all about learning responsibility and such? Things which while the man himself may have done in his past, his tv shows show anything but this. Would he still be regarded as an inspiration after some 11yr old scout decides to go it alone in his local woods and breaks a leg blindly jumping into a rock pool? I think there's an over reaction to Bear. As with all things in life there are probably things we'd rather he didn't or did do but the fact is he's a very popular person with a good following of younger people and he actively encourages them to do more than sit at home and watch TV and I think on balance that's a good thing. I'd rather Bear got people into the Scouts than Jackass got them into amateur stunts for Youtube. I guess it's about striking a balance, you're right he is a touch irresponsible drinking elephant poo, but he gets kids in to hopefully be taught better by our leaders. In my opinion Ray should be our chief scout all day long! I totally agree, Ray Mears pretty much epitomizes all that is useful and enjoyable about the outdoors as well as teaching useful survival skills and being ecologically sound. I have so much respect for the man. The trouble is he doesn't want to be Chief Scout and Bear is happy to give his time. It doesn't annoy me that kids play a lot of computer games and watch a lot of TV, I probably outdo the average teen for hours wasted What does annoy me is kids don't seem to get the chance to appreciate how much fun they could be having outdoors and Bear at least gives it a bit of a push in the right direction.